Interpret, a consumer insights agency, needed a tool that would allow them to get the rich, actionable consumer insights their clients needed. So, they turned to Digsite Sprints to get honest, real-time results from their highly-targeted audiences. 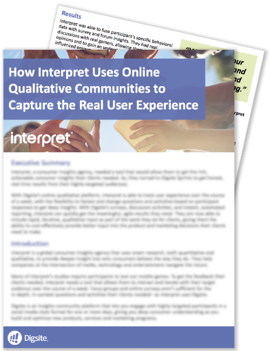 With Digsite’s online qualitative platform, Interpret is able to track user experience over the course of a week, with the flexibility to iterate and change questions and activities based on participant responses to get deep insights.